Panel Spreads Blame For BP Oil Rig Explosion In an excerpt from its final report, the presidential panel investigating what went wrong on the Deepwater Horizon rig outlines error after error made on the rig and onshore by BP and its contractors. The commission's co-chair blames bad management and bad communication. The Deepwater Horizon oil rig burns in the Gulf of Mexico last April. An excerpt of a presidential commission's probe into the rig explosion says risky decisions contributed to the disaster. A 48-page excerpt of the BP oil spill commission's full report includes examples of engineering mistakes and management failures that the panel says led to the disaster. 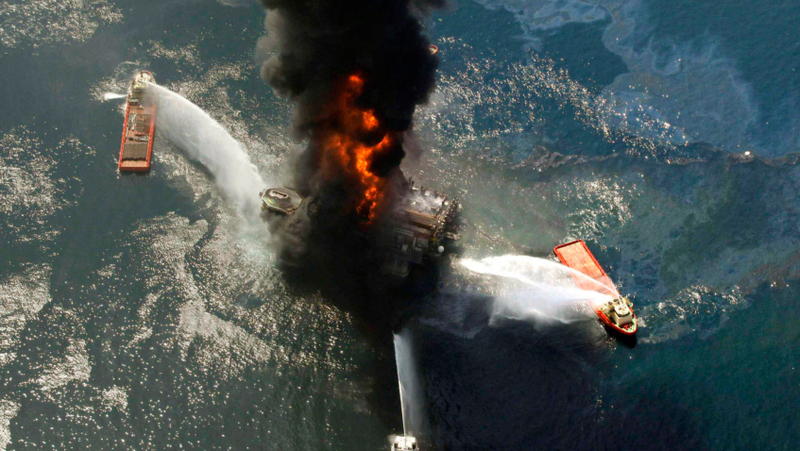 It also cites specific examples of risky decisions made by BP, Halliburton and Transocean. Those two companies are mainstays of the offshore drilling industry. Transocean provides and staffs rigs. Halliburton provides cement to secure the wells, and other services. Reilly -- a board member of oil giant ConocoPhillips who headed the EPA under President George H.W. Bush -- says the companies made baffling decisions that played a role in the disaster. "Given that both of these companies plus BP are active in virtually every ocean, I have concluded reluctantly that we have a systemwide problem that is going to require a systemwide solution," he says. The commission outlines what went wrong on the Deepwater Horizon oil rig, detailing one mistake after another that BP and its contractors made on the rig and onshore. In one example, rig operators were doing something called a "negative pressure test" to make sure a cement job was working to prevent gas from leaking. As Reilly points out, the operators didn't like a reading they were getting from the drill pipe, so they did a second test on another piece of equipment, which came out better. William Reilly, the co-chair of the presidential panel investigating the BP oil rig explosion, says errors leading up to the disaster all point to bad management and bad communication. 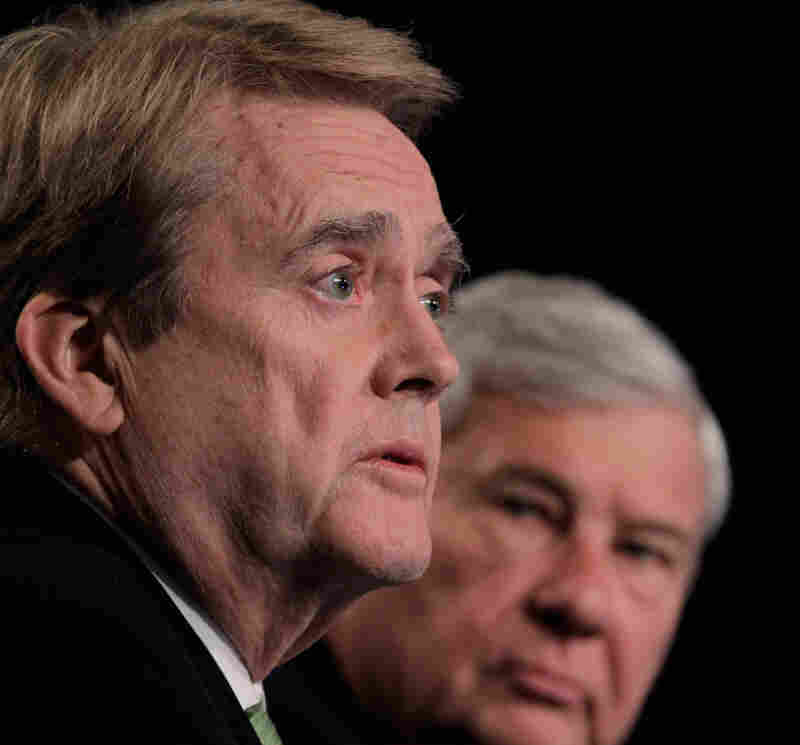 He is seen here with co-chair Bob Graham at a hearing in November. "Inexplicably, a decision was made to take the reassuring test result without trying to figure out why it was inconsistent with the information coming up the drill pipe," Reilly says. The report blames operators for failing to communicate the inconsistent results to anyone onshore and states that if they had, the blowout may not have happened. In another example, before the accident, Halliburton found that the cement slurry that it planned to use was not stable, but Halliburton did little to warn BP. Reilly says these and other errors all point to bad management and bad communication. The decisions the companies made saved time and money, but they increased the risk of a blowout. "The fact that there was a pattern is what created a sense among the commission that this is a large problem," he says. The commission pointedly and repeatedly blames the companies and says the government failed to adequately oversee them. Transocean, BP and Halliburton each declined to comment for this story. But Jack Gerard, the president of the American Petroleum Institute, stresses that the Deepwater Horizon incident was an exception. "The oil and gas industry has been in the Gulf of Mexico for 65 years, and we've drilled over 42,000 wells in the Gulf of Mexico. This was the first incident that has occurred of this magnitude," he says. Gerard says that since the accident, the industry made changes and should be given the green light to fully resume drilling in the Gulf. "We've focused like a laser on improving our safety activities," he says. The new agency that regulates the industry -- the Bureau of Ocean Energy Management, Regulation and Enforcement -- has made drilling rules tougher. But they're not tough enough, according to the commission. It wants beefier government oversight, though the panel doesn't think the agency can do the job alone. Instead, the commission will recommend that the industry start policing itself. It wants the companies to create a safety institute like one formed by the nuclear energy industry after the accident at Three Mile Island in 1979. Commission member Frances Beinecke is president of the environmental group Natural Resources Defense Council. "They're the ones with the expertise. They should be bringing the whole industry up to what are the best operating standards and seek constant improvement," she says. Beinecke says this and other recommendations from the commission would help prevent future tragedies -- if they're adopted. "If they're not, the risk is as great as ever that this could happen again and again," she says. The full report is expected on Jan. 11. It will critique efforts to stop the flow of oil and clean up the mess, and also spell out the commission's recommendations.